Discussion in 'General Lounge' started by DestinyBattle, Aug 19, 2017. This might be the wrong place to put this, and if it is, I'm sure the moderators will move it, or close this down. In any case, I wanted to make this thread, because I've been really interested in the process of animation, particularly in Japan, and even more particularly, in the 1990s, and for this: I would like to tell you guys my favourite anime, and I would like to know yours. 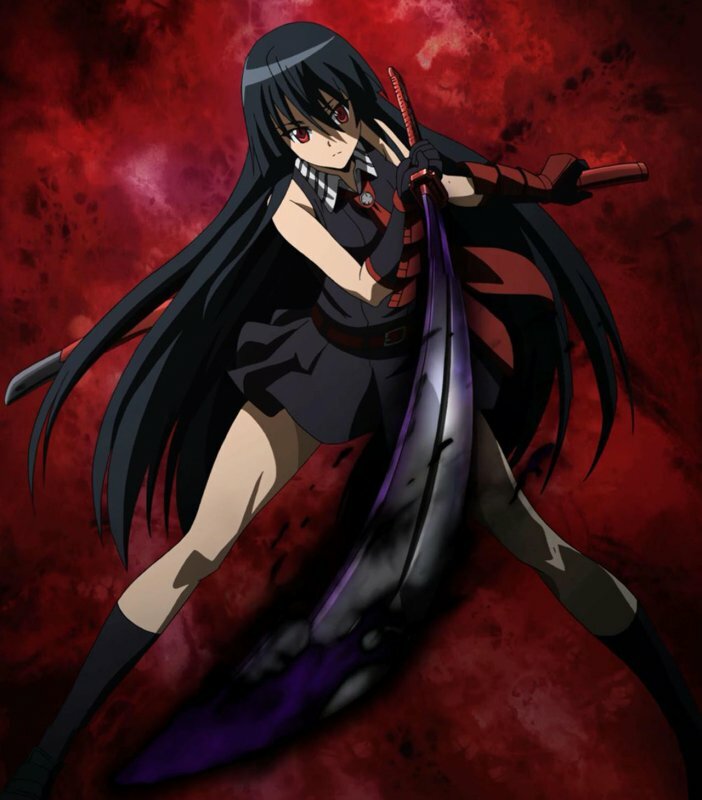 Akame ga Kill's premise is, an Assassin group called "Night Raid" working with the resistance in order to overthrow the corrupt regimen of the Empire. I know this is going to incur the wrath of manga enthusiasts, but hear me out, lol. This is purely down to nostalgia, as this is my first encounter with anime. (Yeah, even before I watched Dragon Ball Z) I don't think this anime is the best, far from it actually. But, I feel the most attached to this one, purely for nostalgic reasons. The characters in this anime are entertaining to watch and I find myself going back to watch this anime again and again. I think I watched this anime like, 25 times. I'm not joking, seriously. XD But, yeah, I do really love this anime and it takes my Number 1 spot. Neon Genesis Evangelion's premise is, an alien species (called Angels) are attacking humanity. It's the first attack in 15 years, and the only source of protection humanity has is the Evangelions, powerful mecha that are design specifically to take out the angels. Only 13-14 year old kids can pilot Evangelion though, and the story takes us through their journey. This may not be my favourite anime, but I think it's the best *I have* ever seen, for many reasons. 1) It was the birth of original animated series. What I mean by this, is that Eva (short for Evangelion), was the first anime episodic series that was created, not based from manga, or any original source material already. (With exception to some from Studio Ghibli, but that was purely to sell merchandise) 2) The themes explored in Evangelion are dark and realistic. The tone of this series is very dark, but also realistic at the same time, which allows us to connect to the characters on a personal level. Take Shinji Ikari for example. (He's the main character) He has no "heroic" qualities, in fact, some my view Shinji as supposed to be a side-character with no significance whatsoever. He is not a "hero". He is not a "good guy". He is simply human. Every character in this series is "human". There are no protagonists, antagonists or any defining role in the story. They are all human. I HIGHLY suggest you give this a watch. Free! 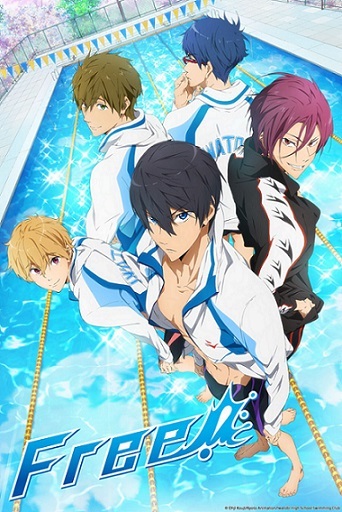 's premise is, 4 high school boys form a swimming club to compete in competitions, because they love to swim. But yeah, those are my Top 3 anime. They probably will most likely change, but the only constant thing in life is change, so I think that should be excused. Please let me know what your favourite anime is/are. It doesn't have to be 1 or 3 like I did, it can be more, if you want. consolcwby, The Mighty Palm, DestinyBattle and 1 other person like this. My favourite Anime changes so frequently. lol. 1. Daiguard - Mecha! In real world situations! Hilarious and heartwarming and amazing. 2. Saiyuki - Demons, and the main characters are amazing. 4. The forst two seasons of Yu Yu Hakusho - Because Kuwabara and Hiei rock! rpgdreamer and DestinyBattle like this. Anyway, here are my favourites. Shigatsu is a music anime about a boy (Kousei Arima) who's stopped playing piano after the death of his mother. 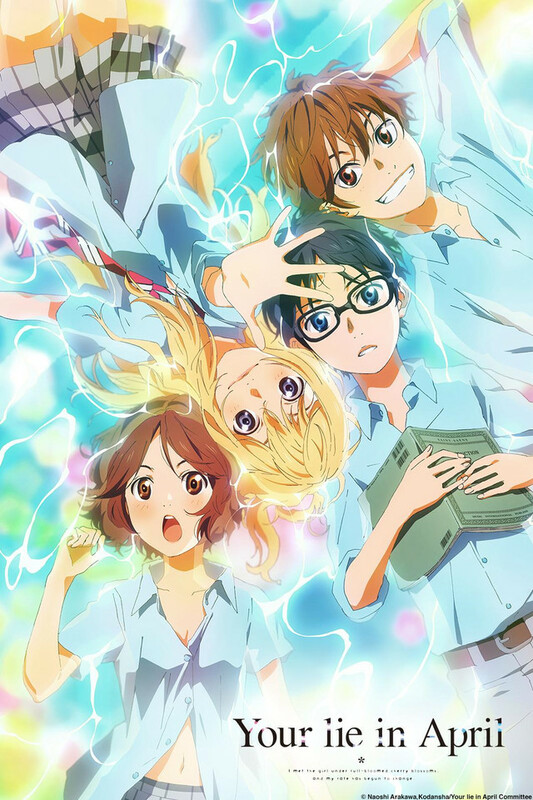 But then he encounters a violinist (Kaori Miyazono) who manages to change his outlook on music, and has transformed him to be a more emotional musician rather than a robot. For me, I like it because I can relate to Kousei A LOT personality-wise, every character is well thought out and rather likable, and the playing scenes... OOH. I'd be standing on my toes every single time. It also works in colours -- just like I do. It's also inspirational as heck, with AMAZING quotes. Yes, I picked the original, for the simple reason that I've never watched Brotherhood. XD It focuses on Edward and Alphonse Elric who have tried to bring their dead mother back to life through alchemy, which results in a catastrophe. The rest of the series follows them as they learn more about alchemy and its right and wrong uses, as well as the side effects of their experiment. OK, I'll admit this is probably due to nostalgia, but I just love it because it can be so creepy at times, and so sweet at others. You also learn the motivations of the enemies and watch some slowly become good, which kind of gives a bit of a spine to them. Plus, the art style is simple, but can capture the mood so well. Philosophus Vagus, Kvothe and DestinyBattle like this. It's everything I look for in moe! Silly, cute and nonsensical. It's moe, it's yuri, and it's silly and cute. What else can I ask for? To be fair, I haven't watched this series since I was about 10 but it was a pretty good one! I'm not really into shounen anymore, but this one was fairly decent, wasn't ridiculously LOOOONG, and had a pretty good dub. I can't go into too much detail because PG-13 site, but it's like if South Park and the Powerpuff Girls had a child. To be honest I prefer Love Live, but this one is a pretty good one too in terms of musical moe. Again, this is something I saw as a little kid, but I'm putting it lower because I find it a bit repetitive nowdays, and the dub is beyond terrible. I just love music moe don't I? ._. But it wasn't the best thing I've seen, but nowhere near the worst. 10. Is It Wrong To Pick Up Girls in a Dungeon? Can't go into detail, PG-13 site. Aniknk, Pixie_Virus, Alexander Hawksmoor and 1 other person like this. Not interested with anime anymore, but I like classic anime. @DestinyBattle , I like Evangelion because of the story. Every episodes tell us what really is, what's lessons and motivation they gave. Especially, the final episode of EVA. But the saddest was The End of Evangelion movie. Great Teacher Onizuka. Seriously...a gangster become a teacher?! Ridicolous...but really fun but not for kids. ...........that's it. I'm had enough with anime. Amarok and DestinyBattle like this. @Paladin-Cleric of Awesome I count DBZA, because it's so funny, comedy in anime is a given for me. HexMozart88 and Arisa like this. @Arisa-Chan Oh no! Not that "Nico Nico Nii!" Tanaka-kun is Always Listless - all my jam. Gundam Build Fighters - my all time favorite that's in the Gundam genre. Hate the sequel. The Royal Tutor and Natsume's Book of Friends, but I haven't really finished much of either yet. DestinyBattle and Arisa like this. Unsure. If found, please notify. Philosophus Vagus and DestinyBattle like this. For me Texhnolyze will always be the pinnacle of anime as a medium, probably the most depressing anime ever too. On the other end of the scale i would add Kemono Friends, yes its an anime with crappy 3d animation made by 10 people and no budget, but its so... perfect in its own way. Kemsyn Not bad...for a human. For nostalgia's sake probably Ninja Scroll, Akira and Fist of the North Star. More recently my favs are Gantz, Parasyte and Psycho Pass. Berserk, the old one not the newer one. I really enjoyed Cowboy Beepop and Full Metal Alchemist. Neon Genesis Evangelion - I forgot about that one, it was good. Aniknk and DestinyBattle like this. These are just 5 of them. I hate ranking lists, which means there are many more Animes I like. Aniknk, DestinyBattle and KayZaman like this.